Kanika Vizan graduated from Kirorimal College, Delhi University. After her graduation she came back to her home town Dehradun to become an educationist. She pursued B Ed from HNB Garhwal University to become eligible for teaching. She started a learning centre by the name Saarthi Education Hub which prepares students for board examinations and also a school for under privileged section of the society called Kites Pre & Remedial School. She is President at Silver Lining Society which is an NGO. An edupreneur or an educational entrepreneur is a social entrepreneur who is involved in changing the way things function in any public education system. 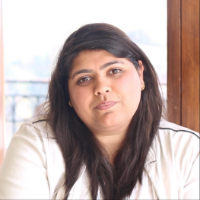 "After my graduation, I came back to my home town Dehradun to become an educationist. I pursued B Ed from HNB Garhwal University to become eligible for teaching. I started a learning centre by the name Saarthi Education Hub which prepares students for board examinations and also a school for under privileged section of the society called Kites Pre & Remedial School. I am President at Silver Lining Society."